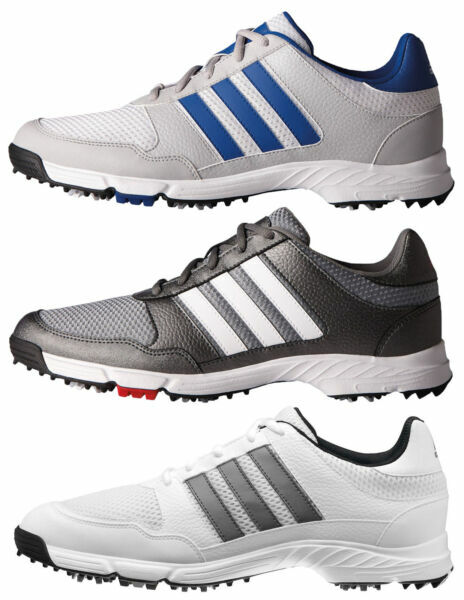 eBay Adidas Tech Response 4.0 Golf Shoes Mens 2017 New - Choose Color & Size! Adidas Tech Response 4.0 shoes are designed with lightweight mesh for incredible comfort and breathability all day long. Adidas Tech Response 4.0 shoes feature a soft EVA insole for added cushioning and support you will love. Adidas Tech Response 4.0 Golf Shoes feature: Lightweight mesh and synthetic upper Incredible comfort 6 spike pattern for added stability Outstanding comfort Thintech low profile sole technology Adidas 3 stripe logo Authorized Adidas Dealer Buy Adidas Tech Response Shoes Welcome to the Carl's Golfland eBay store!Land of Golf Plenty Why Carl's Golfland?At Carl's Golfland we have been in business for over 60 years with (2) Golf World Top 100 store locations in Michigan. Our golf expertise is second to none and we strive to provide the best customer service in the industry! Our knowledgeable, courteous staff is always willing to answer your questions, and get you into the proper equipment to best serve your golf game.We are an authorized Adidas retailer. In other words, NO COUNTERFEIT PRODUCT! Everything we sell is 100% authentic and most new product comes in the original manufacturer's packaging. Buy with confidence! Our near 100% feedback rating speaks to our product selection and customer service. Payment We accept the following forms of payment. PayPal Credit Cards via Phone Sales Tax For shipments to MI addresses, we are required by State law to collect 6.0% Sales Tax. ShippingDomestic ShippingPlease see shipping options above in product information.Standard shipping is UPS Ground or UPS SurePost and expedited shipping is 2 Day Air! WE CANNOT SHIP TO PO BOXES. The map below depicts transit time from our location (Bloomfield Hills, MI 48302) on standard UPS Ground/SurePost shipments. Please note UPS Ground and SurePost estimations are NOT GUARANTEED but merely estimates. Shipping is measured in BUSINESS DAYS. Please note UPS does not consider Saturday, Sunday, or Holidays as a business day. International shippingMost international packages are shipped through eBay's Global Shipping Program (GSP) because of it's reach and convenience. By using the GSP as our preferred international shipping method, your items are shipped domestically to a US shipping center, and then rerouted to the destination. International shipping will be handled, including any applicable duties and taxes that are pre-paid upon checkout, and shipped to you - with full tracking visibility - using a fast, reliable, international carrier.Most international orders not eligible through the GSP are shipped with standard international methods: USPS Priority/Express Mail International & UPS Worldwide Expedited. Buyer is responsible for any additional brokerage, duties and taxes. Please contact your local customs office for all relevant tax information. International shipping time is dependent upon the shipping method and speed of your local customs department. Return PolicyDo I qualify for a return/exchange? - You may return/exchange NEW/UNUSED product for a full valued return within 30 days of your purchase date located on your invoice. Any used club does not qualify for a return/exchange; using your club(s), for even one shot, does not constitute new and a refund cannot be issued. We have to be able to sell them as brand new!If your order received free shipping and you are returning it your refund will be processed minus the shipping cost. Do I have to pay freight? - You are responsible for any/all costs associated with shipping the shoes back to our facility. We cover any standard freight cost going back out to your address on an exchange. Please also note that original shipping charges are NON-REFUNDABLE. International orders do NOT apply.How do I set up a return/exchange? - You can use any one of the following methods to set up a return or exchange for your original purchase: Carl's Golfland Returns Page- Visit the website located on the bottom of the invoice that you received with your product, to quickly and easily set up your Return Authorization number (WRA# or RA#). eBay Returns - The easy-to-use eBay Returns feature allows you to generate a return label, with all of the necessary address information, and send it back hassle free. Simply note the reason for return and drop it off at your local pickup. Phone - Give us a call! One of our courteous online service representatives would be more than happy to get you a Return Authorization number or answer any questions you may have! Warranty Information: Your Adidas shoes may qualify for a full manufacturer's warranty! Warranty information is generally located on the exterior of the shoe box and varies by manufacturer and style (comfort, waterproof, etc...) Please note, this is not a Carl's Golfland warranty, but a Adidas warranty. Ultimately the manufacturer has full discretion; they determine how each individual warranty is handled and can accept/decline any warranty for any reason. Being an authorized Adidas dealer, we are more than happy to help facilitate any warranty claims. Warranties purchased by international customers are only valid within the United States (Adidas USA). International buyers are responsible for ALL FREIGHT as well as any applicable duties and taxes associated with getting the product to our facility and back to you. Warranties do not apply to misused product and are only typically accepted in normal wear-and-tear condition. Warranties only cover MANUFACTURER DEFECTS. Didn't answer your question? - Simply shoot us an eBay message or give us a call as we're more than happy to help answer your questions. We thank you for your understanding of our return policy and are very willing to provide returns and exchanges without any re-stocking fees.